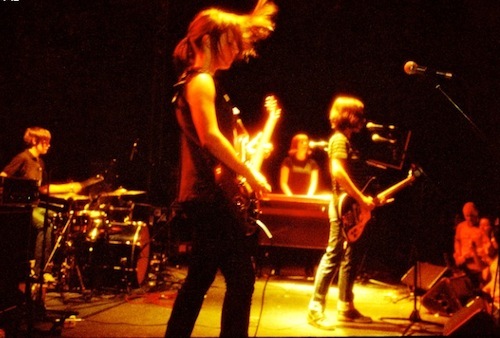 Brighton-based indie rock band Electrelane was formed in 1998 by Verity Susman (keyboards, farfisa organ, lead vocals, guitar, saxophone, clarinet) and Emma Gaze (drums). The two were joined by Mia Clarke on guitar and backing vocals and Ros Murray (aka Ray Rumours) on bass. Their music draws from a wide range of influences including Sonic Youth and The Velvet Underground. They have released four albums so far: Rock It to the Moon, their mostly instrumental debut, The Power Out, Axes and No Shout, No Calls. Their fourth LP was written in Berlin during the 2006 Soccer World Cup, recorded in Benton Harbor, Michigan in late 2006, and released in May 2007 worldwide. Electrelane is one of the better things to happen to the independent music movement.